We report the fabrication and characterization of zinc oxide (ZnO) thin-film transistors (TFTs) on flexible cyclo-olefin polymer (COP) substrates. The bending durability and the rupture mechanisms for the fabricated devices were also investigated. 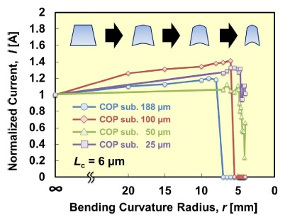 For two-terminal devices and TFTs, the electrical resistance increased sharply at a radius of curvature of about 7 mm, suggesting that stretching deformation occurred in the ZnO film due to fracture of the underlying SiO2 buffer layer. However, it was found that this problem could be avoided by considering the surface strain and reducing the thickness of the substrate. Using a 25-µm-thick COP substrate, a flexible device could be fabricated that functioned at a curvature radius of less than 5 mm. Such flexible oxide-based electronic devices are promising for use as wearable biological sensors and other advanced sensing applications. We have investigated characteristics of Al2O3 thin films, which are deposited by plasma-enhanced atomic layer deposition (PE-ALD) and thermal ALD (TH-ALD) with oxygen plasma and H2O as oxidant gas, respectively, and Al(CH3)3 precursor. The Al2O3 film, which was deposited at 50℃, exhibited a large leakage current property. The positive (~1018 cm－3) and negative fixed charges (~1012 cm－2) occurred in Al2O3 film and at SiO2/Al2O3 interface by PE-ALD process at below 150℃, respectively. On the other hand, the opposite fixed charges were observed by TH-ALD process. This is due to the different reactive intermediates of Al-C-O and Al-O-Al-CH groups in Al2O3 film by PE-ALD and TH-ALD processes, respectively. The fixed charge in Al2O3 film disappeared over 200℃. The dipole (~1013 cm－2) also occurs at SiO2/Al2O3 interface and leads to positive flatband shift of 0.6 V. Therefore, we should pay careful attention to ALD condition such as oxidant gas and growth temperature considering to applications. In the previous study, we have developed a technique to produce electrospray of aqueous solutions in vacuum. This technique could be expected to be a high-intensity massive cluster ion beam, and we are evaluating the performance of the vacuum-type electrospray droplet ion gun. In this study, the mass to charge ratio and the charge states of the droplets were experimentally evaluated by measuring the flight time of the droplets and observing the impact marks on the smooth surface after droplet beam irradiation. We studied a pumpdown curve in the low and medium vacuum regimes for a conductance-limited pumping. Senda [H. Senda, SEI Technical Review 176, 1 (2010).] 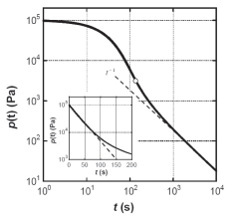 predicted that the exponential decrease of the chamber pressure, followed by the reciprocal behavior with time near the lower limit of the viscous flow. He proposed a pressure boundary between the exponential decrease and the reciprocal decrease as a “Bifurcation pressure”. We experimentally found bifurcation pressures and they quantitatively compered with the theoretical estimation. The result of our experiment agreed fairly well with values that had been obtained by the theoretical calculation. 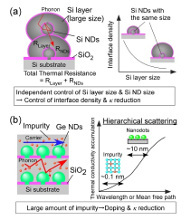 Si films including hierarchical nanodot structures were developed using ultrathin SiO2 films. Scattering bodies with various size scales are expected to scatter phonons with various wavelengths. This idea is important for reduction of thermal conductivity because phonon, that is boson, with various wavelengths, can contribute to the heat transport. 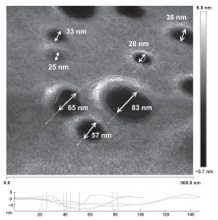 Here, in Si films including Si nanodot structures, the nanodots with various sizes reduced the thermal conductivity effectively in addition to increase of dopant activation rates. Furthermore, highly-doped Si films including Ge nanodots that have atomic scale and nanoscale phonon scattering bodies exhibited drastically-reduced thermal conductivity. This drastic reduction of thermal conductivity came from hierarchical structures that include nanodot structures working as strong phonon scattering bodies. This gives the guideline of control of phonon and carrier transport using nanostructures for high performance thermoelectric materials. We present energy-momentum mapping of excited surface electrons in the topological insulator Sb2Te3 by using time- and angle-resolved two-photon photoemission spectroscopy combined with polarization-variable midinfrared pulsed laser excitation. It is demonstrated that a direct optical transition from the occupied to the unoccupied part of the surface Dirac-cone permits the linear and circular photogalvanic effect, which thereby enables us to control the electric surface photocurrent by laser polarization. Moreover, our photocurrent analysis on excited electrons directly visualizes ultrafast current dynamics in the surface Dirac-cone dispersion in the time domain. Our observations pave the way for coherent optical control over surface Dirac electrons in topological insulators. 3D structures of evaporated metals onto a TiO2(110) surface premodified with ortho-mercaptobenzoic acid (o-MBA) were studied using polarization-dependent total reflection fluorescence X-ray absorption fine structure (PTRF-XAFS) technique to determine the effects of the premodification on the dispersion of the metal atoms over the TiO2(110) surface. 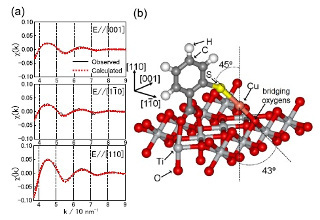 Cu, Au and Ni were found to be atomically dispersed, with the formation of S-metal-O bonds (where the S is provided by the o-MBA and the O is present in the TiO2 lattice) on the surface. In contrast, Pt underwent aggregation to form small clusters. The varying behavior of these metals on the o-MBA-modified TiO2(110) surface can be explained based on the energy difference between sulfur-metal-oxygen and metal-metal bond formations, and we propose a new indicator for single metal dispersion on the TiO2(110) surface. Growth and structural properties of self-assembled quantum dots (QDs) of III-V compound semiconductors such as InGaAs by molecular beam epitaxy are described. 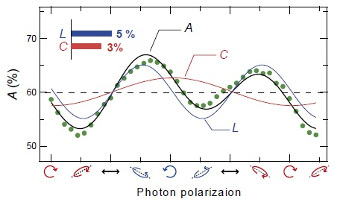 The dynamics of photo-excited carriers are detected by time-resolved photoluminescence. Time-dependent injection processes of carriers and spin-polarized ones from barriers into QDs are studied, which are largely affected by a state-filling effect characteristic in the QD. This filling effect can be suppressed at high temperatures or in high-density QD ensembles. Vertically coupled QDs with a 2-dimensional electron system of quantum well (QW) are proposed for the purpose of efficient capture and injection of spin-polarized electrons from layered structures into QDs. 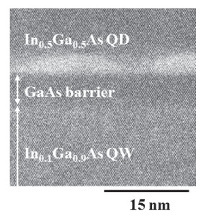 Ultrafast spin-conserved tunneling with time constants ranging from 5 to 20 ps, depending on the barrier thickness from 2 to 8 nm, from the QW into the QDs is demonstrated with sufficiently high rates of spin conservation more than 90%. The activity of the Committee for Scientific Meetings and Symposia, Vacuum Society of Japan, in the last three years has been summarized, featuring organized sessions and best poster awards at its annual symposia, topical meetings, etc.